At the Backup Mode step of the wizard, select the mode in which you want to create a backup. Storage — if the Managed by backup server option was selected at the Job Mode step of the wizard. Destination — if the Managed by agent option was selected at the Job Mode step of the wizard. Volume level backup — select this option if you want to create a backup of specific computer volumes, for example, the system volume. When you restore data from such backup, you will be able to recover data on these volumes only: files, directories, application data and so on. With this option selected, you will pass to the Objects step of the wizard. File level backup — select this option if you want to create a backup of individual directories on your computer. With this option selected, you will pass to the Objects step of the wizard. [For file-level backup] If you want to perform backup in the snapshot-less mode, select the Backup directly from live file system check box. 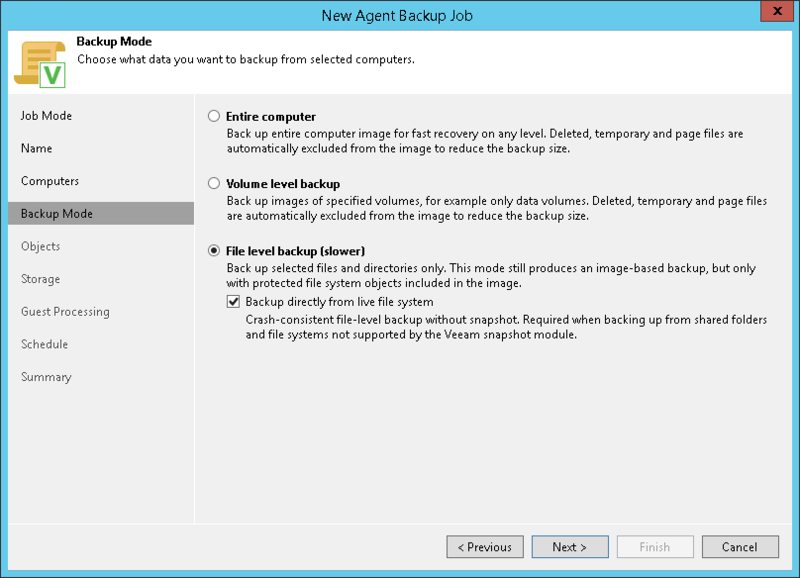 With this option selected, Veeam Agent for Linux will not create a snapshot of a backed-up volume during backup. This allows Veeam Agent to back up data residing in file systems that are not supported for snapshot-based backup with Veeam Agent for Linux. To learn more, see the Snapshot-Less File-Level Backup section in the Veeam Agent for Linux User Guide. File-level backup is typically slower than volume-level backup. Depending on the performance capabilities of your computer and backup environment, the difference between file-level and volume-level backup job performance may increase significantly. If you plan to back up all folders with files on a specific volume or back up large amount of data, it is recommended that you configure volume-level backup instead of file-level backup.